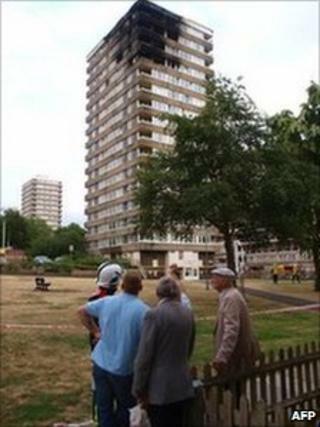 A woman arrested in connection with a tower block fire in south-west London is undergoing psychiatric assessment after being bailed, police have said. The fire which engulfed the top floors of Madingley block on the Cambridge Estate, Kingston upon Thames, is being treated as suspicious. Sixty families have been left homeless by the blaze which began on Monday. The 32-year-old woman, who was arrested later that day, was taken to a hospital after being bailed on Tuesday evening. A Metropolitan Police spokesman said: "She was taken to a south London police station and on the evening of Tuesday, 13 July, was taken to a psychiatric hospital for a period of assessment. "The woman has been bailed by police to an unspecified date." It took up to 100 firefighters four hours to bring the fire under control, after it spread rapidly through the top four floors and roof of the 15-storey council-owned block in St Peter's Road. No-one suffered injuries in the fire. But some residents said they had been forced to use the lift to evacuate the building due to speed with which the fire took hold.